Identify and engage your advocates online and off with beautiful creative, relevant rewards, and complete control. Create an effortless, integrated advocate sharing experience. 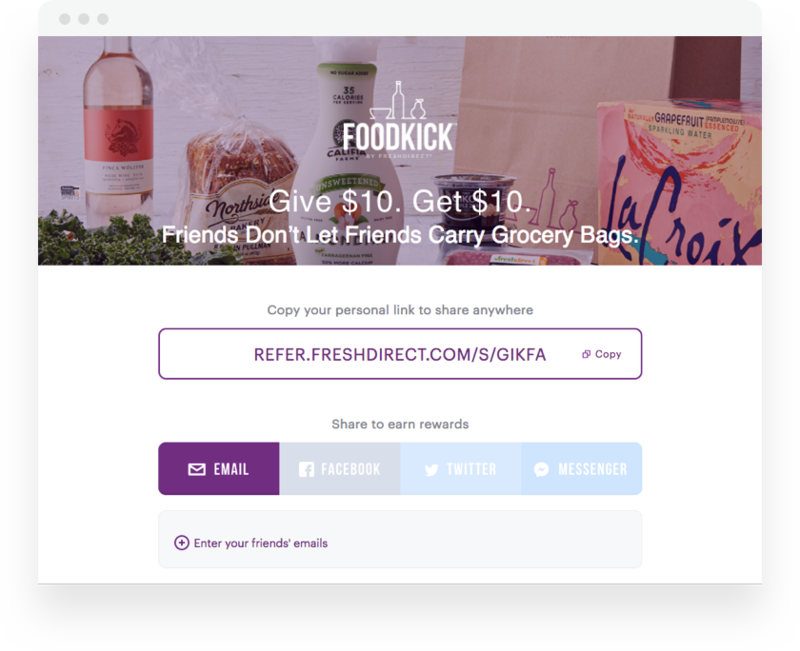 A referral program tailored to your brand will turn more of your customers into advocates and increase brand awareness. 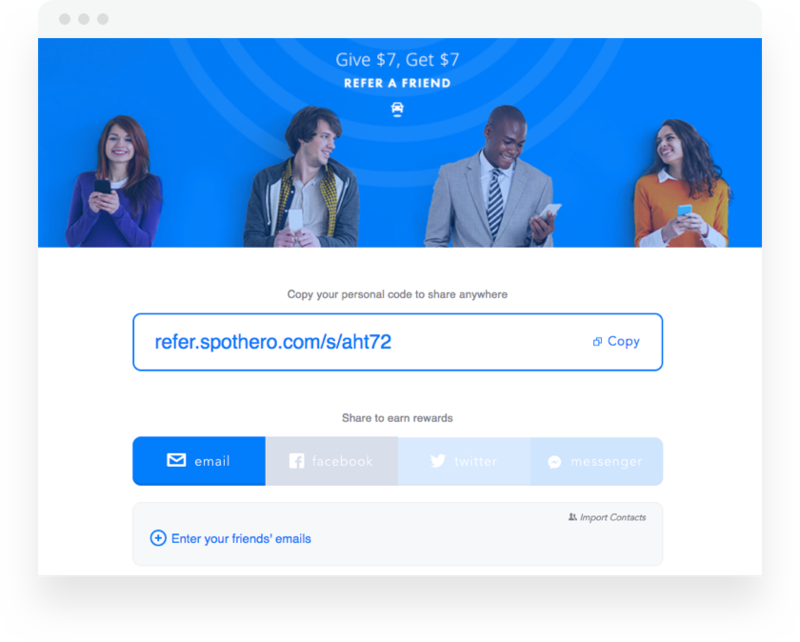 Extole provides referral marketing software that drives engagement and increases your conversions. 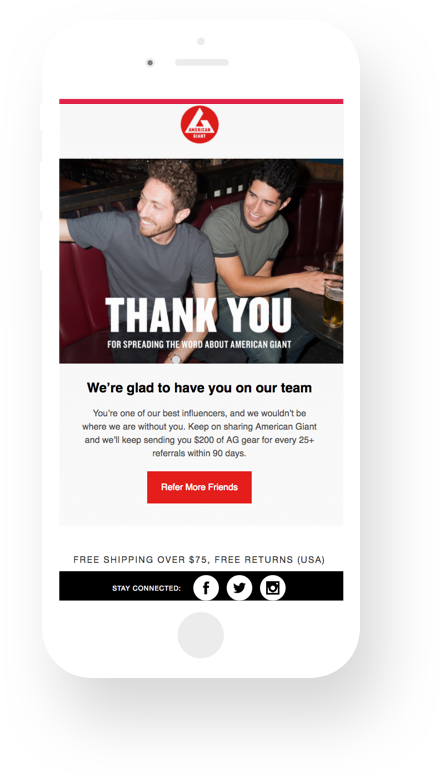 Your advocates and their friends expect instant rewards, and you can customize these incentives to perfection for each referral marketing campaign. Real-time rewards create instant gratification and encourage even more sharing and referrals. We’ve also got built-in fraud protection, so you can protect your brand and your margin. Set sophisticated rules to detect and prevent low-quality referrals. The Extole platform makes it easy to find and reach great influencers. Your best customers – those who share and those who respond – are your unique advantage. Use first-party and social network data about your advocates to power your marketing efforts. 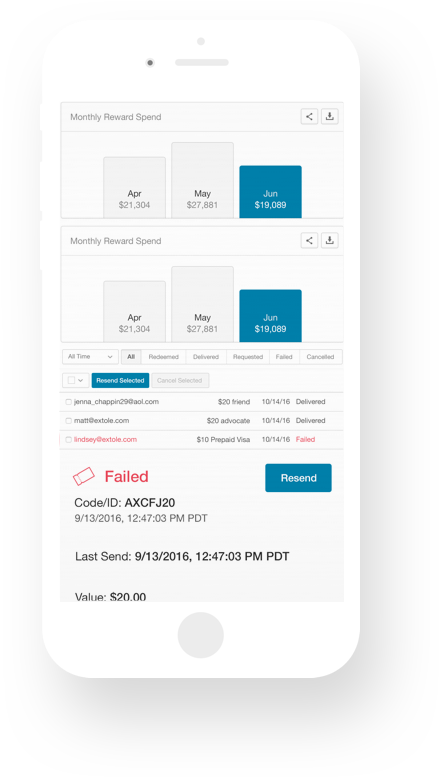 With audience specific targeting, Extole makes it to easy tailor rewards, content, and even business rules based on different audience segments. This ability lets enterprises easily manage multiple simultaneous programs. In addition, each program can have mutliple variants in order to a/b test any aspect of your referral program. Test creative, offer, and business rules to understand performance. Easily assign different audiences to different programs in order to have tailored experiences. 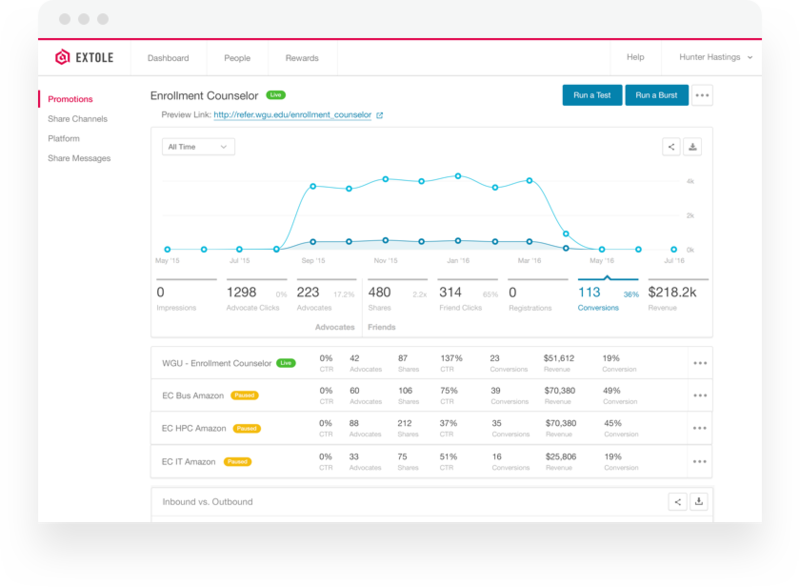 Manage programs, campaigns, and tests in a single dashboard that gives immediate insight and control. Extole offers a variety of advanced features and capabilities that help you extend the reach and impact of your advocacy marketing. Run increased reward bursts to spark more advocacy and keep your program fresh. Let your customers share specific items so that they can recommend not just your brand but the perfect product. Engage influencers with special Extole campaigns that track and reward them. You know that refer-a-friend programs need to be friction-free. Sharing and referring must be as easy as possible for your customers. 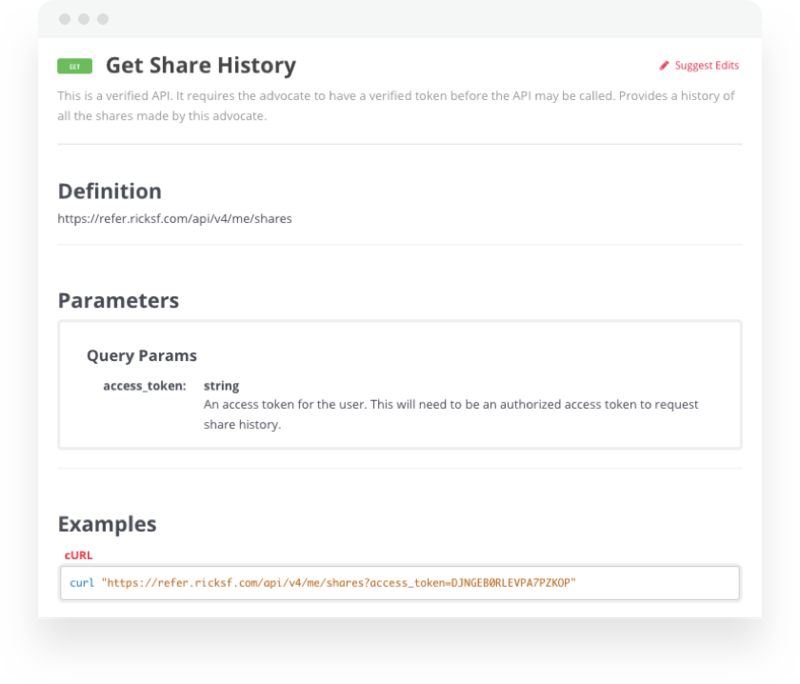 Our powerful API and webhooks give your customers a seamless experience across your app and website, no matter what device they’re using.